Republicans must have gotten tired of being called the “do-nothing” Congress, given how in the past few days after their extended vacation they have gotten right to work. That is, if you count as “work” filing pointless legislation. There is Rep. Bill Cassidy [R-LA] and Rep. Leonard Lance [R-NJ], taking the first swipes at repealing Obamacare. (H.R. 3849 and H.R. 3851) Their latest entries follow closely behind the introduction by Rep. Mike Coffman [R-CO] of the “No Bailouts for Insurance Industry Act of 2014,” which does nothing to prevent bailouts but does repeal sections 1341 and 1342 of the Affordable Care Act. From the department of empty gestures comes Rep. Tom Reed’s [R-NY] bill to block subsidies for health plans for members of Congress who buy insurance through the health care exchange (H.R. 3853). Don’t furrow your brow trying to figure out the implications. Like most of his colleagues, Tom Reed is a millionaire and can afford his own insurance. Sen. Mike Lee [R-UT] has introduced a Heritage Action-supported bill that would allow states to bypass federal accreditation for higher education under Title IV (S. 1904). Rep. Randy Weber [R-TX], the lawmaker who took Ron Paul’s old seat last year, has made a name for himself by trying to impeach Attorney General Eric Holder and refusing to return a campaign contribution eight times the legal limit. He is also standing up for marriage. He’s introduced a bill (H.R. 3829) to “amend chapter 1 of title 1, United States Code, with regard to the definition of ‘marriage’ and ‘spouse’ for Federal purposes and to ensure respect for State regulation of marriage.”) The bill is unlikely to become law, so we can assume his now-undefended bond with his wife of 30 years will soon dissolve. Ladies, take note. Rep. Ed Whitfield [R-KY] has planted his flag on defending the public against having the Environmental Protection Agency regulate greenhouse gas (H.R. 3826). Sean Duffy [R-WI] of “Real World” fame is standing up for privacy on the health care exchange website, despite the fact that no personal health information is used (H.R. 3835). Rep. Shelley Capito [R-WV], West Virginia Senate candidate and “good friend” of disgraced former House Speaker Tom Delay introduced H.R. 3819, the Fairness for Community Job Creators Act that, despite its friendly name, is about protecting bank holding companies from having to divest collateralized debt obligations. Could the fact that the third largest bank holding company in the United States, Citigroup, is among her largest contributors have anything to do with this? Sen. Mark Kirk [R-IL] introduced a similar bill but with a less creepy title in the Senate (S. 1907, “A bill to amend a provision of the Bank Holding company Act of 1965”). Rep. Richard Hudson took a swipe at it, too, with the Risk Management Certainty Act (H.R. 3814). My only question: If I introduce a bill deregulating CDO’s, can I have a check, too? Rep. Jeff Duncan [R-SC] is following the lead of outgoing Tea Partier Michele Bachmann and introduced a bill to stop all these commie energy-saving light bulbs (H.R. 3818, the Thomas Edison BULB Act). Rep. Tom Marino [R-PA], whose district is entirely landlocked, wants to repeal the law that links federal flood insurance subsidies to actual flood risks. Owing to global warming, which he does not believe in, the risk of encouraging rebuilding in flood zones has increased. This has caused most sensible people to agree that insurance rates for building that beachfront dream home should go up a tick. Not Marino. He has the confidence of someone who survived being forced from the Pennsylvania attorney general’s office in a corruption scandal that linked the congressman to the mafia (H.R. 3815). It means we have a party that has no interest in governing and is unwilling to even try. It really is that bad. 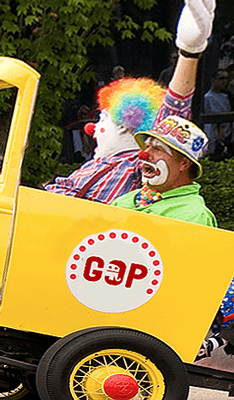 The clown car pulls up each term and the same crazy ideas tumble out. What to the left looks like a neurological condition is in fact a tactic. Every time they lose, they miseducate a few more people and feed their base’s well-established persecution complex. We have heard it all before, but the clowns on the right don’t care what we think. This show isn’t for us.